Kibuishi, K. (2010). Copper. New York, NY: Graphix. Subjects: Boys, Dogs Human-animal relationships, adventure and adventurers, cartoons and comics. Kazu Kabuishi, the author/illustrator of the highly popular graphic novel series Amulet has brought his fans a printed version of Copper, an adorable comic strip collection which consists of mainly one-page comics shots interspersed with a few longer ones (Mushroom Crossing, Maiden Voyage, Picnic) featuring the adventures of an imaginative, loner, bright, curious, and adventurous boy named Copper and his worrisome, fearful, pessimistic, and talking dog, Fred. Their adventure settings are a combination of both real and make-believe. Though this was designed as a series of webcomics (Bolt City) and the book is more of an anthology rather than a graphic novel, there still is some on-going character development. Copper and his dog Fred share adventures that encompass the mundane to the fantastic as well as all sorts of odd situations they get themselves into. They can venture anywhere in the world or out of it by way of their dreams and reality, though at times a reader may be unsure if it is or is not a dream. 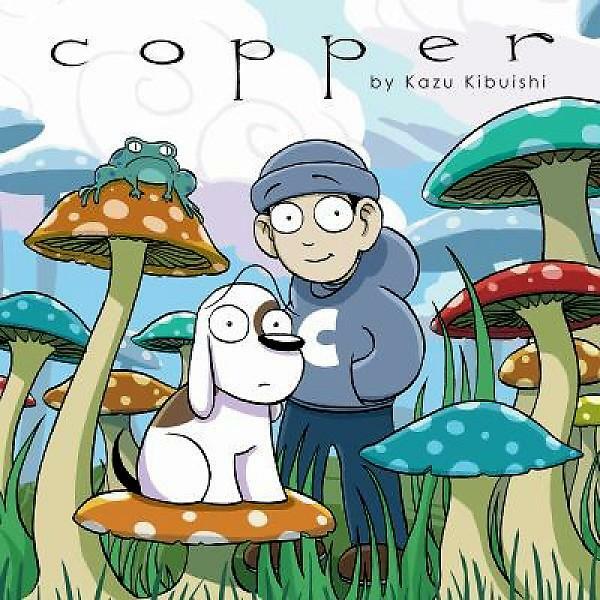 Kabuishi’s Copper comics are often philosophical as will be easily identifiable by older readers as Copper and his dog struggle with loneliness, the sense of mortality, and even potential abandonment as they encounter numerous challenges. As a result, it’s hard not to notice an underlying theme of sadness or questioning one’s existence. Copper may remind some of a reverse Charlie Brown-Snoopy dynamic or a more mature Calvin and Hobbes. Fred, adds much humor with his deep existential concerns regarding his future death, being replaced by Copper, if other people care about him, or if he will ever have a friend. Though Copper and Fred can be viewed as polar opposites, their bond is strong as observed through their adventures navigating a forest of mushrooms, crash landing a homemade plane, traveling into space, dancing with robots, playing video games, shopping, fishing, and even surfing. Their escapades include events drawn from everyday life to bizarre fantasy, science fiction, and even apocalyptic settings. Kazu Kabuishi’s illustrations are simple, clean, colorful, flat, and will draw the reader in along with the enjoyable story line The characters and settings are all well-defined, with the backgrounds frequently subtle. The stories have a simplistic feel but often tackle deeper philosophical thoughts and readers never know what type of comic format to expect on the next page but will be assured that it is another fun adventure. Copper includes a 12-page concluding section explaining the steps involved in making Copper and the production of comic books from the first concept to the final color work that will interest fans and aspiring comic writers and artists. Copper is great for those that enjoy good art and less complex stories, and is a beautiful addition to any graphic collection.